When Coca-Cola debuted in 1886, it was sold in pharmacies (“druggist”), as a “brain tonic”, a remedy for indigestion and/or nervousness. And, among at least a dozen other benefits, as a “headache specific”. 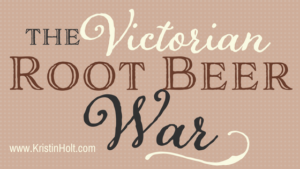 Coca-Cola may have tasted good (a spoonful of sugar helps the medicine go down)…but its origin is firmly planted in the Patent Medicine arena. Most medicines of the day contained substances such as cocaine, morphine, and/or alcohol. For Coca-Cola to have contained an appreciable amount of cocaine in its six-ounce serving size is no surprise whatsoever. 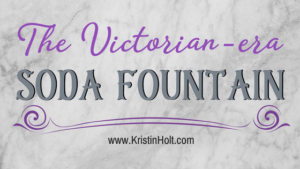 Yes, caffeine (from the Kola nut) can work wonders for some kinds of headaches. 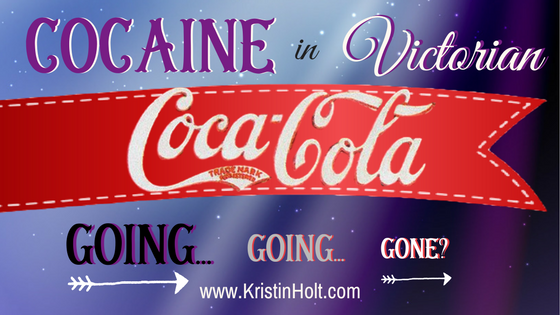 Yet Coca-Cola advertised numerous success stories of relieving ongoing, difficult headaches. As a severe headache sufferer, I’m not surprised that cocaine and caffeine would yield such a desirable result. Sometime in the 1890s, the focus on health benefits, treatments of everything from dyspepsia to headache–and hence a Patent Medicine–slowly melted away. 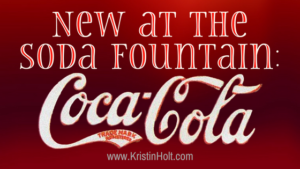 The already advertised “refreshing drink” tactic was going strong, and this became Coca-Cola’s focus in advertising. 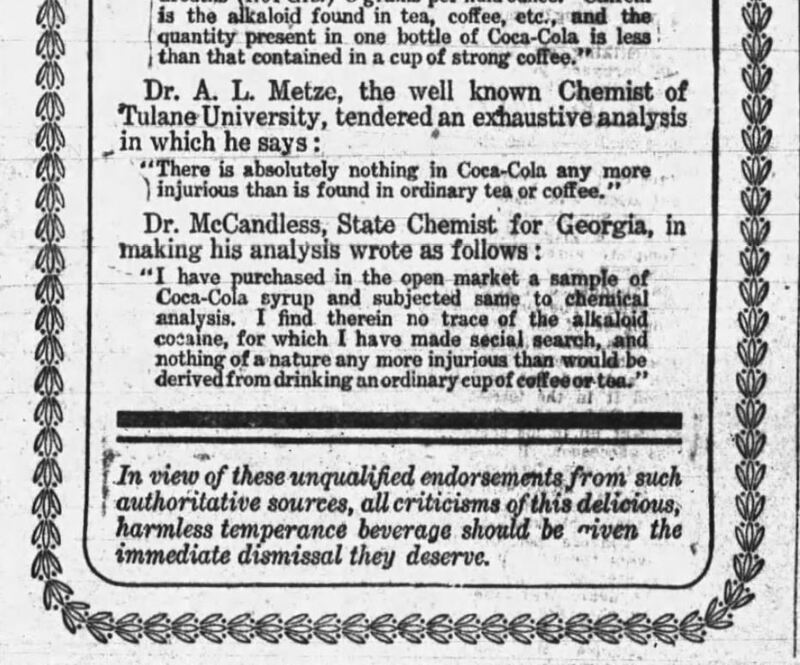 I draw this conclusion from the numerous vintage newspaper advertisements I’ve located while researching this blog article series… and from Snopes’s comment, (in full , below), stating that Candler and Robinson cut the amount of coca extract in their formula to a mere trace, at the time of the outcry in 1891 over the potential dangers of addiction to cocaine. 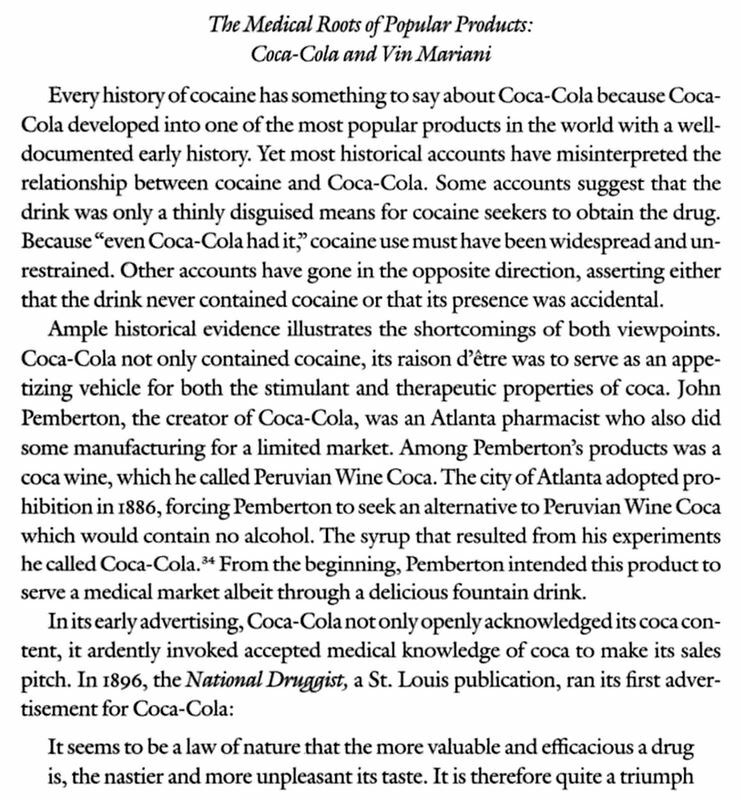 Perhaps the best look at the concept, in arrears, is from the title: Cocaine: From Medical Marvel to Modern Menace in the…. Cocaine: From Medical Marvel to Modern Menace in the United States, 1884-1920, p75. Image: Courtesy of Google. 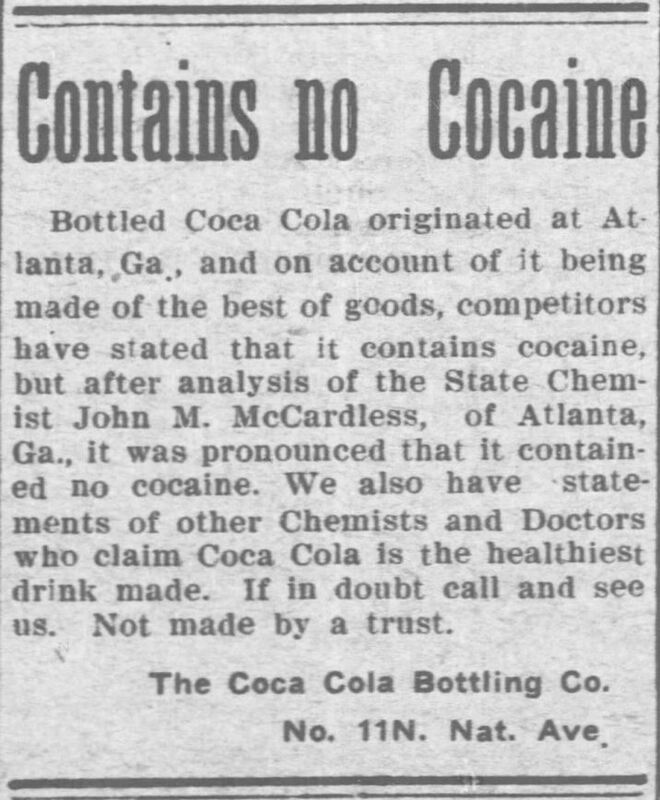 Note that the first advertisement for Coca-Cola in the National Druggist is cut off at the bottom of page 75 (and page 76 is not available inside the Google Preview, and understandably, the snippet above, attributed to the title [Cocaine: From Modern Medical Marvel to Modern Menace in the United States, 1884-1920] is a copyrighted preview. 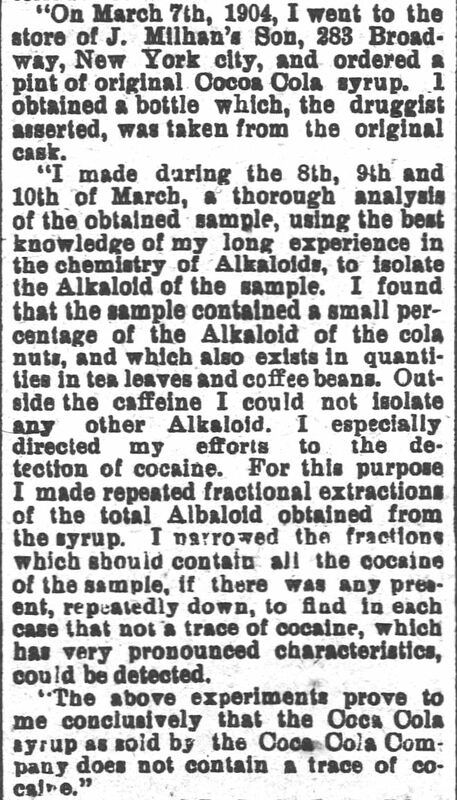 But the following snippet is of the original source the author of Cocaine references: National Druggist, 1896, p. 214, providing the rest of the quotation in context. 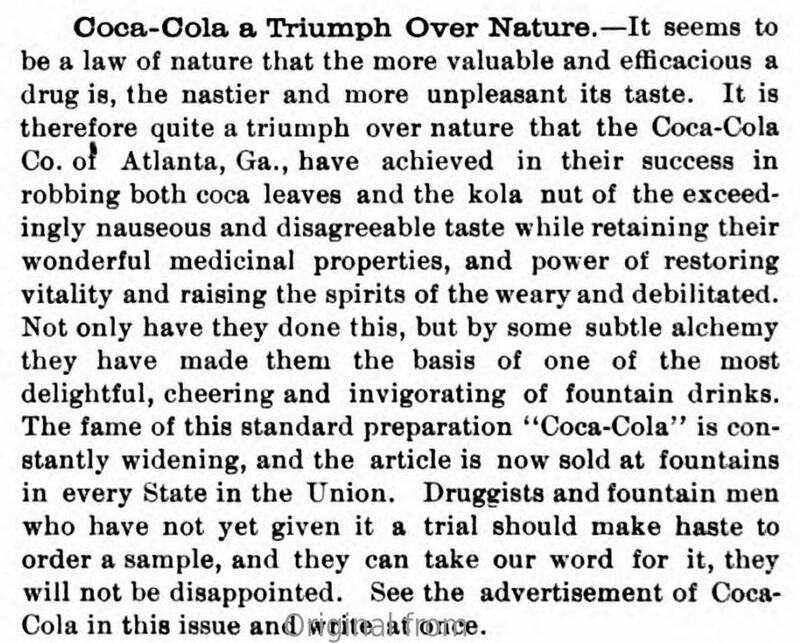 “Coca-Cola a Triumph Over Nature.” This advertisement in National Druggist, 1896, p. 214 courtesy of HathiTrust.org. 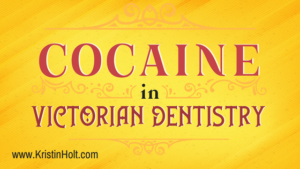 … Just how much cocaine was originally in the formulation is hard to determine, but the drink undeniably contained some cocaine in its early days. 2) Cocaine continued to be an ingredient in the syrup in order to protect the trade name “Coca-Cola”. 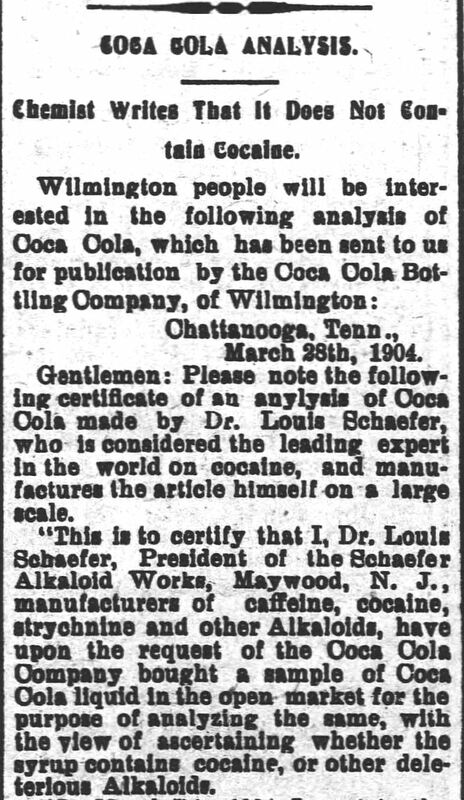 Candler believed that his product name had to be descriptive, and that he must have at least some by-product of the coca leaf in the syrup (along with some kola) to protect his right to the name Coca-Cola. Protecting the name was critical. Candler had no patent on the syrup itself. Anyone could make an imitation. 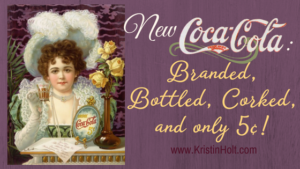 But no one could put the label “Coca-Cola” on an imitation so long as Candler owned the name. The name was the thing of real value, and the registered trademark was its only safeguard. Coca leaves had to stay in the syrup. ITTY-BITTY PINCH, OR A WHOLE LOT? I’m not surprised to see a wide disparity between quoted sources (and original sources) for just how much cocaine was in “a glass”, as well as how many ounces were served in “a glass” (as that affects just how much cocaine any recipient consumed… nor have I seen any limits set by druggists. 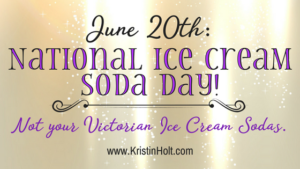 I can easily see someone consuming two or three glasses for a particularly tough case the patent medicine / soda fountain delicacy was touted to eradicate). … He [Asa Candler] further said in his card that a gallon of coca-cola contained the extract of only a half ounce of coca leaves, and no sensible man would undertake to say that this quantity in a gallon would hurt a person taking a glass of the beverage. 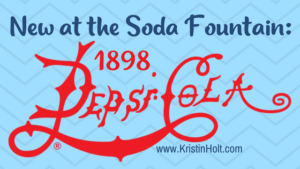 … For the past 18 years since [Coca-Cola] was created in 1885, this renowned soft drink has contained some 9 milligrams of cocaine per 7 ounce glass and has a fairly large dose of the caffeine rich kola bean in every one of those servings, too. Those ingredients provide a powerful “pick-me-up” for thirsty customers everywhere. 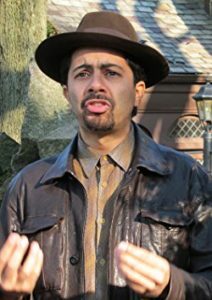 Ricardo Cortés, Author and Illustrator. Image: Courtesy of Amazon’s Ricoardo Cortés page. Now, to be fair, the whole point of processing the coca leaf to remove the cocaine (and seeing it safely into the hands of pharmaceutical company/ies) is to keep the flavor of the remaining leaf extract, without the “cocaine”–the alkaloid the scientists searched for and purportedly couldn’t find in the Coca-Cola syrups of 1904 and beyond. The public outcry (or perhaps drops in sales at Soda Fountains and druggists), along with the changes researchers like Cortes argue did occur, yielded a rash of newspaper “proof”. 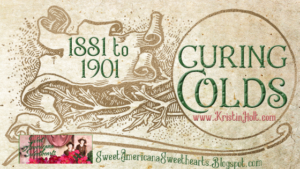 Starting at least as early as Spring, 1904, numerous postings in newspapers declare independent studies of Coca-Cola syrup find the beloved brand to be free of all offending ingredient(s). I found numerous vintage newspaper articles and advertisements stating (under solemn oath) various scientists’ findings. As I’ve emphasized in other articles, I’m acutely aware that simply because a newspaper prints “the truth” doesn’t make it truthful. Leaving that awareness on the table, let’s examine early 20th century postings regarding the issue. Chemist analyzes Coca-Cola for Caffeine and Cocaine. Part 1 of 3. The Wilmington Morning Star of Wilmington, North Carolina, on April 15, 1904. Chemist analyzes Coca-Cola for Caffeine and Cocaine. Part 2 of 3. The Wilmington Morning Star of Wilmington, North Carolina, on April 15, 1904. Chemist analyzes Coca-Cola for Caffeine and Cocaine. Part 3 of 3. The Wilmington Morning Star of Wilmington, North Carolina, on April 15, 1904. Contains no Cocaine. Blaming competition. Fort Scott Daily Tribune and Fort Scott Daily Monitor of Fort Scott, Kansas on May 23, 1905. 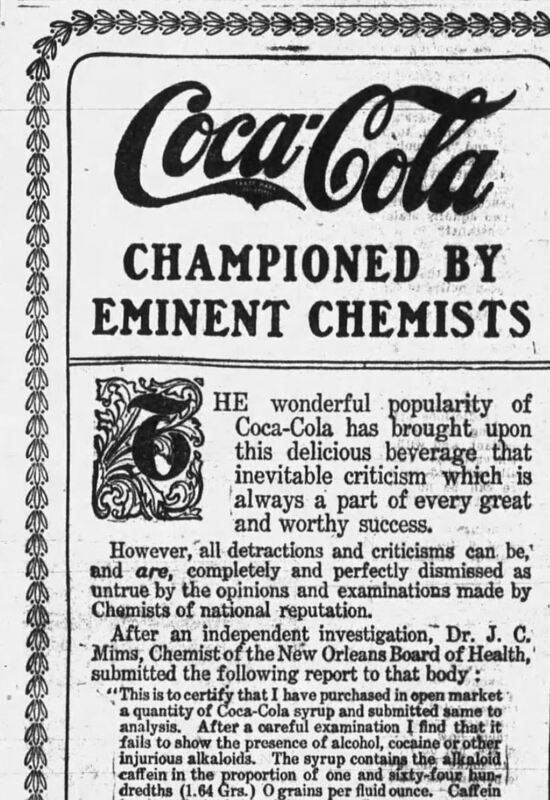 While the following article (The Watchman and Southron, 1906) does not state, in the body of the text, that competitors are at fault for rumors of injurious substances in Coca-Cola, the headline does: “Prominence Makes a Target“. Coca Cola Harmless; Prominence = target. The Watchman and Southron of Sumter, South Carolina on January 24, 1906. Due to the shape of this rectangular article, I couldn’t make it large enough to read easily, and maintain the heading. Thus a careful transcription follows, with spelling, punctuation, paragraphing, and content as identical to the original as could be reproduced. 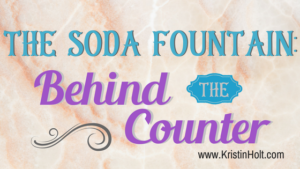 On account of the wonderful sale which Coca-Cola has throughout the country, much has been said concerning this delightful beverage, regarding its properties, healthful and otherwise. 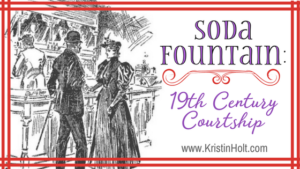 Some ardent temperance people have even gone so far as to claim that this soda fountain beverage contained alcohol. These comments in some localities were of such a nature that a few of the city health boards, and in one or two instances, the State board, and even some newspapers have taken it up. 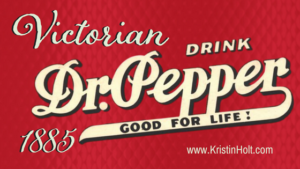 It is gratifying to know that this great Southern drink has been able to show a clean bill of health wherever it has been investigated. 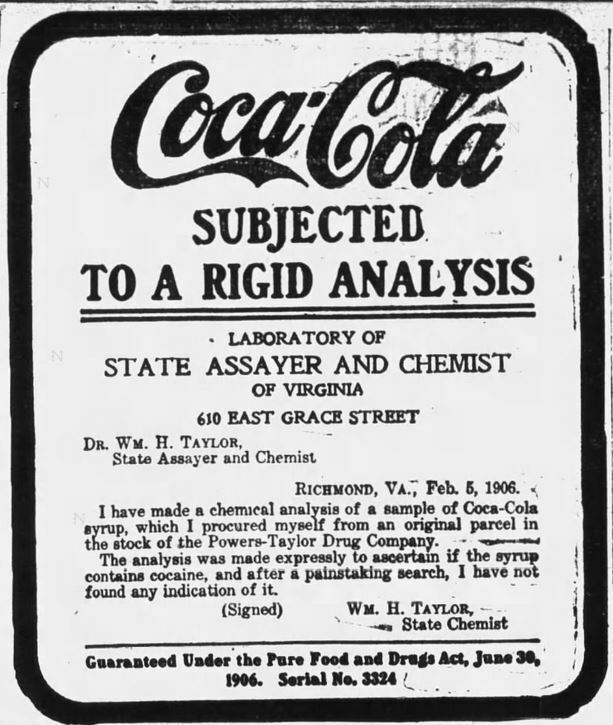 “This is to certify that I have purchased in the open market a quantity of Coca-Cola syrup and submitted same to analysis, After a careful examination I find that it fails to show the presence of alcohol, cocaine or other injurious alkaloids. “This syrup contains the alkaloid caffeine in the proportion of one and sixty-four hundredths (1.64 Grs.) 0 grains per fluid ounce. “Caffeine is the alkaloid found in tea, coffee, etc, and the quantity present in one bottle of coca-Cola is less than that contained in a cup of strong coffee. In addition to this Dr. A.L. Metz, of the Tulane University and a chemist of national reputation, submitted quite an exhaustive analysis in which he stated . “I have purchased in the open market a sample of Coca-Cola syrup and subjected same to chemical analysis I find therein no trace of the alkaloid cocaine, for which I made special search, and nothing of a nature any more injurious than would be derived from drinking an ordinary cup of tea or coffee. Such distinguished chemists as Dr. Louis Schaefer, of new York, and Dr. W.L. Cliff, of Philadelphia, have analyzed Coca-Cola and reported most favorably on the healthful properties of Coca-Cola. 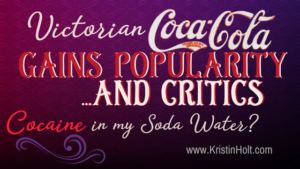 In view of the unequalified [sic] endorsements of Coca-Cola there can be no question as to its delightful and refreshing properties as claimed by the manufacturers. ~ The Watchman and Southron, January 24, 1906. Coca-Cola Championed by Eminent Chemists. Part 1 of 2. Daily Arkansas Gazette of Little Rock, Arkansas on July 29, 1906. Coca-Cola Championed by Eminent Chemists. Part 2 of 2. Daily Arkansas Gazette of Little Rock, Arkansas on July 29, 1906. Coca-Cola Subjected To A Rigid Analysis. Daily Arkansas Gazette of Little Rock, Arkansas on February 27, 1907. I’ve shared only a fraction of the testimonials by numerous, highly qualified chemists and scientist of the day. So many more were published in newspapers (the primary mode of communication to the public in the Victorian and Edwardian Era). No amount of reassurance made the problem go away. Just four years later (1911), Judge Sanford (Federal Court) ruled “that the coca-cola people must disclose the mysterious “merchandise No. 5,” the principal ingredient used in the manufacture of coca-cola syrup” [sic]. Coca-Cola won’t reveal Merchandise No 5. Part 1. Daily Press of Newport News, Virginia on march 25, 1911. Coca-Cola won’t reveal Merchandise No 5. Part 2. Daily Press of Newport News, Virginia on march 25, 1911. Simon Whistler, in a relatively long (but fiercely entertaining) YouTube video about Coca-Cola’s recipe–speaks of the myth/”tall tale” that only two people at any given time know the trademark recipe. 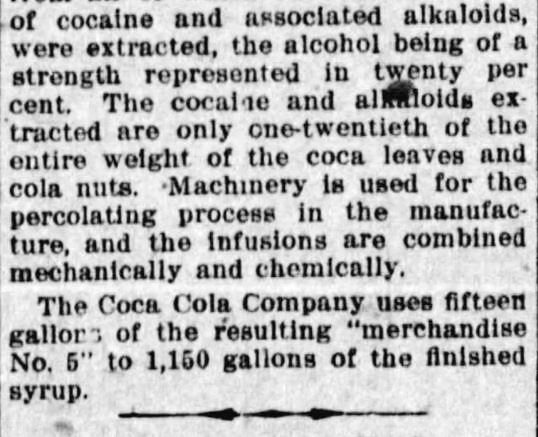 In the Bonus Facts near the conclusion, Simon explains that the “spent” coca leaves were used after 1903, thus providing flavor without the cocaine content. Not surprisingly, Simon’s information agrees with that of author Ricardo Cortés. One thing is for certain: The More Things Change, The More They Remain The Same. Dr. L. Schaefer didn’t want to reveal the trade secrets he’d been entrusted with, hence the court order to spill the beans (after all, as Simon Whistler puts it, Secrets are Special). Likewise, Coca-Cola goes to great lengths to keep their formula a special secret… though not as secretive as only two people knowing all at the same time. This video is worth the 13.33 minutes (13 minutes, 20 seconds, AND commercial interruption). Enjoy!